Dogecoin continues to make a buzz not only in the world of cryptocurrency and online gambling industry, but also in the sport scene as it sponsors yet another athlete—a NASCAR racer this time. Shortly after its successful crowdfunding for the Jamaican bobsled team and luger Shiva Keshavan in the 2014 Olympic Winter Games in Sochi, the rapidly growing Dogecoin community has raised a total of 67.8 million dogecoins or $55,000 a few days after the crowdfunding campaign started on Reddit. “Just a week ago this was only an idea and now it’s a reality. 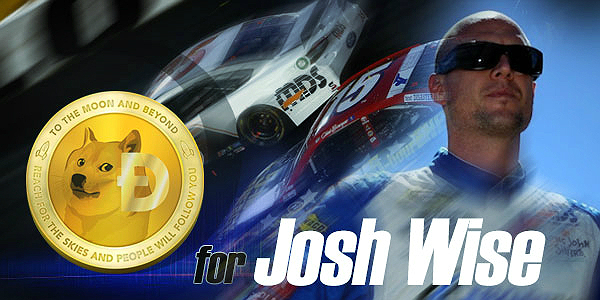 So thankful for all the fans, Reddit community and Dogecoin for doing this,” said NASCAR racer Josh Wise in his Twitter post after learning about the sponsorship. The sponsored car will bear the black color for the May 4 race after Dogecoin users voted for the best design through a user poll hosted on the Doge 4 Nascar website. The recent Dogecoin sponsorship is testament to the effort of its users to drive the cryptocurrency’s popularity to greater heights. Although it was only launched in December 2013, Dogecoin has already made a record after beating the trading volume of Bitcoin and other cryptocurrencies combined in January of this year. Created to become a ‘fun’ alternative cryptocurrency, Dogecoin is slowly but surely achieving remarkable growth in the industry. With the spotlight now on this virtual currency, it can be expected for Dogecoin gambling to also receive immense support from the community of online gamblers. Moreover, the continued sponsorship of various athletes make Dogecoin fit for sports betting purposes.